Ojo's World: Does it Matter? We live in a world where, unfortunately, we judge on looks first, above all else. I'm not talking about finding a future partner, but finding employees! When you are looking for love, looks would be the first thing you would see. Those looks might not be what others are attracted to, but it's what's important to YOU at that particular moment, that counts. However, when it comes to employment, shouldn't abilities go beyond the way someone looks? 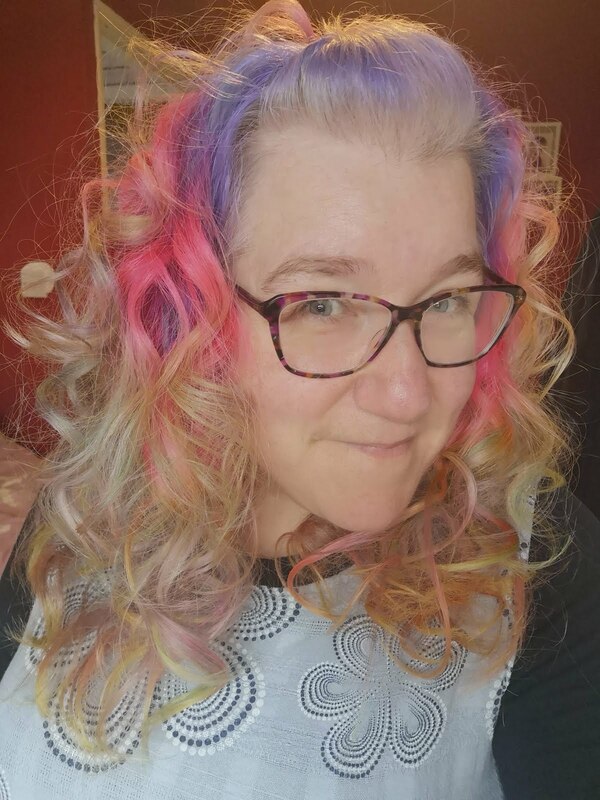 I put a poll on Twitter, around a week ago, asking if people would be offended if being served in a shop by someone with hair like mine (pictured above). I only had a few responses but the overwhelming answer was NO, why should it bother them?! I go out and about and people always comment on my hair, the majority of it being positive. One thing I hear a lot of though is: I would love to do that, but work won't let me. If a nurse is fully trained, but has blue hair, rather than brown, does it make her less qualified to look after you? I worked in shops from the age of 16, until my youngest was born. 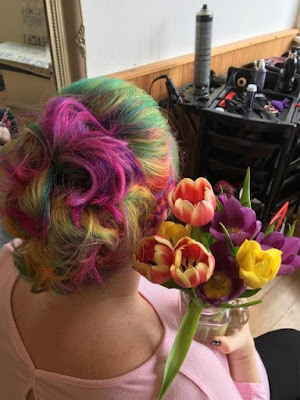 If I went back to it now, would I be less capable because I have rainbow hair? I know that some people will say it's about looking professional, but that simply brings us back to an antiquated opinion: That buttoned up rule keepers are best for the job. Yeah OK, because Boris Johnson is just bloody awesome isn't he? Every country leader is far more qualified because they are 'beige', aren't they?? If you walked into your bank tomorrow, to take out a mortgage, would you really judge the lenders competency based on their hair colour? If you do, it says more about you, than them. Our world is forever moving forward, maybe it's time our judgements did. We aren't a 'black and white' world, why shouldn't we express ourselves with colour. Even if you wouldn't colour your hair the same, or have a tattoo, does it give you the right to think those that do are less capable? For all you know that, buttoned down, beige, bank manager, could be covered in tattoos under his suit? What would you say if your bank manager had blue hair. Or you nurse had rainbow hair? It doesn't really matter what colour someone's hair is as long as they can do the job they are supposed to...There is a rule in my teens school that only natural hair colours is allowed and even though my teen doesn't want to dye her hair what difference would it make to her learning if she had pink, red or blue hair. No it doesn't matter, as long you you love it.